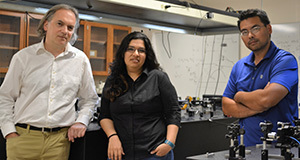 Collaborative research at the University of Notre Dame has demonstrated that electronic interactions play a significant role in the dimensional crossover of semiconductor nanomaterials. The laboratory of Masaru Kuno, professor of chemistry and biochemistry, and the condensed matter theory group of Boldizsár Jankó, professor of physics, have now shown that a critical length scale marks the transition between a zero-dimensional, quantum dot and a one-dimensional nanowire. The findings, “Dimensional crossover in semiconductor nanostructures,” were published in Nature Communications. Matthew P. McDonald and Rusha Chatterjee of Kuno’s laboratory and Jixin Si of Jankó’s group are also authors of the publication. A quantum dot structure possesses the same physical dimensions in every direction while a quantum wire exhibits one dimension longer than the others. This means that quantum dots and nanowires made of the same material exhibit different optical and electrical responses at the nanoscale since these properties are exquisitely size- and shape-dependent. Understanding the size- and shape-dependent evolution of nanomaterial properties has therefore been a central focus of nanoscience over the last two decades. However, it has never been definitively established how a quantum dot evolves into a nanowire as its aspect ratio is made progressively larger. Do quantum properties evolve gradually or do they suddenly transition? Kuno’s laboratory discovered that a critical length exists where a quantum dot becomes nanowire-like. The researchers achieved this breakthrough by conducting the first direct, single particle absorption measurements on individual semiconductor nanorods, an intermediate species between quantum dots and nanowires. Single particle rather than ensemble measurements were used to avoid the effects of sample inhomogeneities. Furthermore, an absorption approach rather than an often-used emission approach was employed to circumvent existing limitations of modern emission-based single particle microscopy — namely, its restriction to the observation of highly fluorescent specimens. The discovery marks a significant advance in our understanding of the size- and shape-dependent quantum mechanical response of semiconductor nanostructures. “All of the introductory-level solid state or semiconductor textbooks need to revise what they say about dimensional crossover,” Jankó said. “This is another example where interactions makes things completely different.” Beyond this, Kuno suggests that the single particle absorption approach advanced in the study “has practical, real-world applications, maybe 40 years down the road.” Examples include the generic and label-free ultrasensitive detection of chemical and biomolecular species of paramount interest within the spheres of homeland security as well public health. Kuno’s group performed the experiments that led to the discovery while Jankó’s group provided theoretical support. Originally published by Gene Stowe at news.nd.edu on August 31, 2016.